Whenever I go food shopping, I try to stick to this list of essential pantry ingredients. These ingredients are essential in a pantry because they allow you to make a HUGE variety of recipes. Haven’t you ever started a recipe only to realize that you’re out of some basic, staple ingredient? How annoying is it to break the flow of cooking and head to the grocery store JUST TO BUY GARLIC??!! That is why whenever I go shopping I make sure to stock up on these ingredients. 2. Tomatoes – Fresh and Canned! Crushed tomatoes are really helpful sometimes! 3. Chicken Stock – I don’t have time to make my own, so I buy it in cartons. 6. White Wine – Buy something good! 8. Eggs – Ok, these next few are not exactly “pantry” but they are essential in the kitchen! 9. Butter – Unsalted, of course! The ingredients below are not essential, but they are pretty darn important! When making almost any recipe, you will most likely need to use some of the ingredients above, so get in the habit of keeping them stocked! 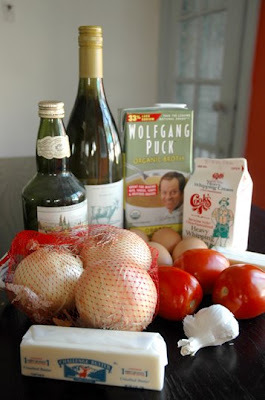 Do you have other ingredients not on my list that are essential in your kitchen? I can’t believe I forgot FLOUR! Good eye! I agree, these are all so important. Even if you don’t have much else in the kitchen, If you are stocked with these ingredients, you are guaranteed to be able to come up with something. I also always have flour and some kind of bean (navy, black etc.) on hand. Great list! « Easy Pea Soup Recipe!